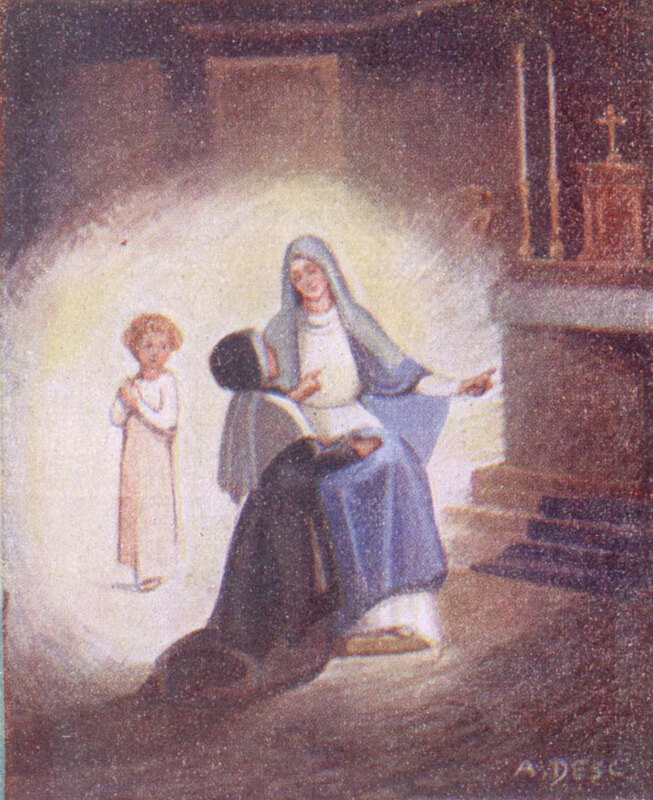 Between July and December 1830, Sister Catherine Labouré, a young Seminary Sister (novice) of the Daughters of Charity, received the extraordinary favor of three apparitions with the Virgin Mary. In the preceding months, Catherine also had the privilege of other apparitions. 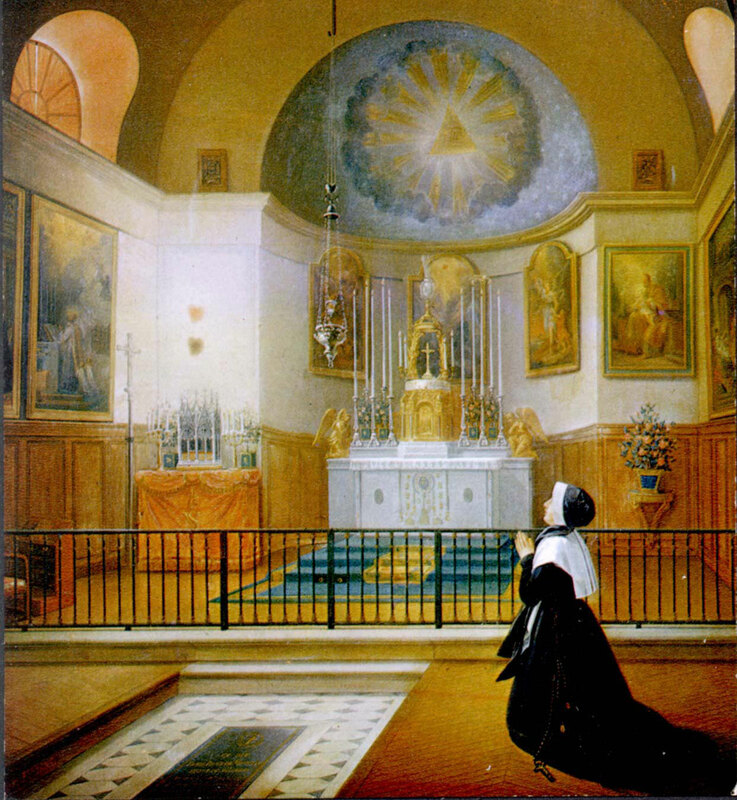 First, Saint Vincent de Paul revealed his heart to her: While at prayer in the chapel, Catherine saw, on three successive days, the heart of Saint Vincent appearing in three different colors. The heart first appeared white, the color of peace; then red, the color of fire; and then black, an indication of the misfortunes that would come upon France (and Paris in particular). Soon afterwards, Catherine saw Christ present in the Eucharistic host. “I saw Our Lord in the Blessed Sacrament all the time of my seminary except the times when I doubted.” On June 6, 1830, the feast of the Holy Trinity, Christ appeared as a crucified King, stripped of all his adornments. 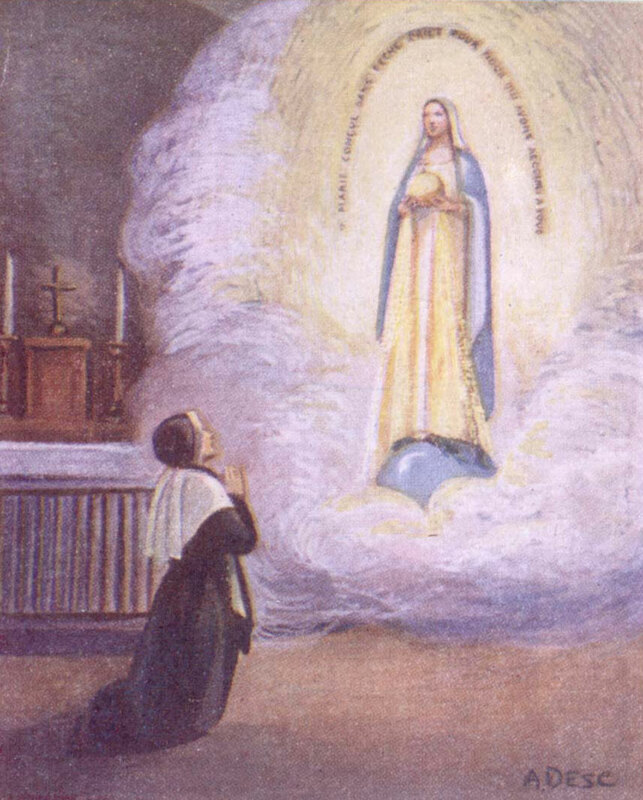 On July 18, 1830, the eve of the feast of Saint Vincent, Catherine prayed that, through his intercession, her desire to see the Blessed Virgin Mary would be fulfilled. Previously, at the death of her mother when Catherine was a child, she asked Mary to be her mother. At eleven-thirty that night, Catherine heard someone call her name. A mysterious child stood at the foot of her bed and asked her to get up. “Sister Labouré, come to the chapel. The Blessed Virgin is waiting for you,” he said. Catherine dressed and followed the child, who was “bringing rays of brightness wherever he passed.” Having arrived in the chapel, St. Catherine stopped near the priest director’s chair in the sanctuary. She then heard a sound “like the rustle of a silk dress.” Her little guide then said, “Here is the Blessed Virgin.” Catherine hesitated. But, the child repeated in a stronger tone of voice, “Here is the Blessed Virgin.” Catherine rushed to the chair and knelt at the feet of the Blessed Virgin, who was seated on the chair, and Catherine rested her hands on the knees of the Mother of God. “There, a period of time passed, the sweetest of my life. It would be impossible for me to say what I experienced. The Blessed Virgin told me how I should behave towards my spiritual director and also several other things.” The Blessed Virgin pointed to the altar where the tabernacle was and said, “Come to the foot of this altar. Here, graces will be given to all who ask for them with confidence and fervor.” Catherine’s new mission was to spread this promise of God and Mary to the world. Also, Mary asked for the establishment of a Confraternity of the Children of Mary. Catherine’s confessor, Father John Mary Aladel, C.M., would accomplish this request on February 2, 1840. 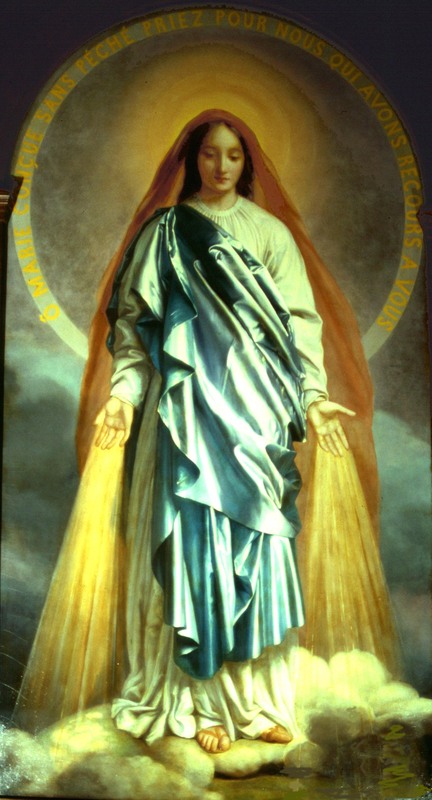 In the second image, beautiful rays of light streamed from the Blessed Virgin’s open hands, which were covered with jeweled rings. At that same moment, St. Catherine heard a voice say, “These rays are a symbol of the graces that I pour out on those who ask them of me.” Then, an oval formed around the apparition, and Catherine saw this invocation emblazoned in gold letters shaped in a semi-circle: “O Mary conceived without sin, pray for us who have recourse to you.” She then heard the words, “Have a medal made in this image. For those who wear it with confidence, there will be abundant graces.” Finally, the image turned, and Catherine saw the reverse side of the medal: the letter “M” surmounted with a little cross; two hearts below the cross, one crowned with thorns and the other pierced with a sword; and twelve stars bordering the medal. In the month of December 1830, during meditation, Catherine again heard the rustling sound, this time behind the altar. The same image of the medal appeared near the tabernacle, slightly behind it. 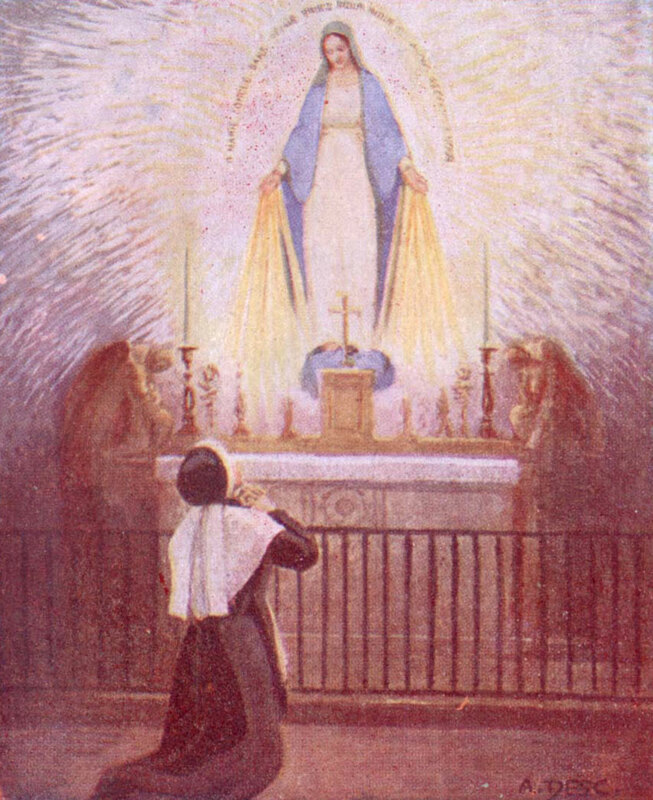 “These rays are the symbol of the graces that the Blessed Virgin obtains for those who ask them of her…You will not see me anymore.” This was the end of the apparitions. Catherine communicated the requests of the Blessed Virgin Mary to Father Aladel (her confessor). He was not receptive to her message and forbade Catherine to even think about it. Though a terrible blow to her, Catherine obeyed her confessor. On January 30, 1831, Catherine finished her Seminary and received the habit of the Daughters of Charity. The next day, she set off for the Hospice of Enghien, which had been established by the Orléans family and was located at 12 rue de Picpus on the east side of Paris. In this impoverished neighborhood, she would serve elderly men and poor persons for 46 years quietly and in complete obscurity. When Fr. Aladel heard this, he was very much troubled: “If Mary is displeased, it cannot be with the young Sister, who in her position is powerless to do anything, so it must be with me.” Fr. Aladel felt as though he could no longer take upon himself the responsibility of rejecting the communications made to him by his penitent. So, he consulted his Superior, Fr. Jean Baptiste Etienne, C.M., without disclosing the name of Sister Catherine, who desired to remain unknown. It was then decided that such an important matter should be submitted to the Archbishop. Accordingly, the two priests called on Archbishop De Quelen, of Paris, to whom a detailed account of the visions was given. 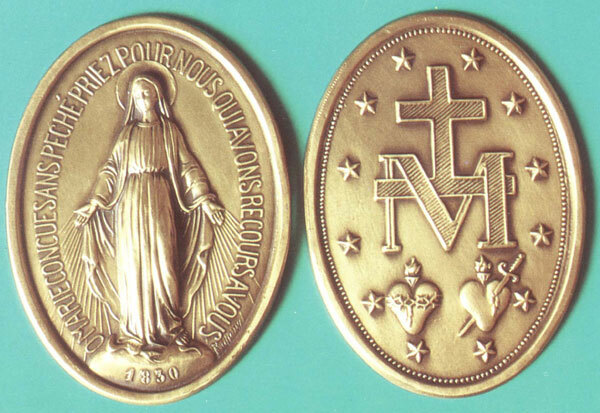 Having listened with great interest to the wonderful story, His Grace said that he could see no objection to having the medal struck, as it was in no way opposed to the Catholic Faith; on the contrary, it was conformable to the devotion of the faithful to Our Lady. He felt it would contribute to her honor, and he requested to have some of the medals sent to him after they were struck. By autumn of 1834, there were already 500,000 medals in existence. In 1835, there were more than one million worldwide, and by 1839, more than 10 million medals had been distributed. At the time of the death of Sister Catherine in 1876, it is estimated that over one billion medals had been distributed!